Okechukwu Obodo is a widower who is well into his 70s. He lives in a one-room dwelling that is so orderly he can immediately tell when anything is out of place, and he’s good at building a fire for cooking — not bad for someone who’s been blind for 15 years. Obodo lives in Ogonogoeji Ndiuno community, a village in Nigeria's southeastern Enugu state where vehicles clatter percussively across a rusted steel bridge and a weathered sign welcomes visitors to "The Blessed Royal City of God." A swift-flowing river tumbles over a picturesque little waterfall, providing all the water villagers need. It also provides a perfect breeding environment for the tiny black flies that carry river blindness (or onchocerciasis) from person to person. 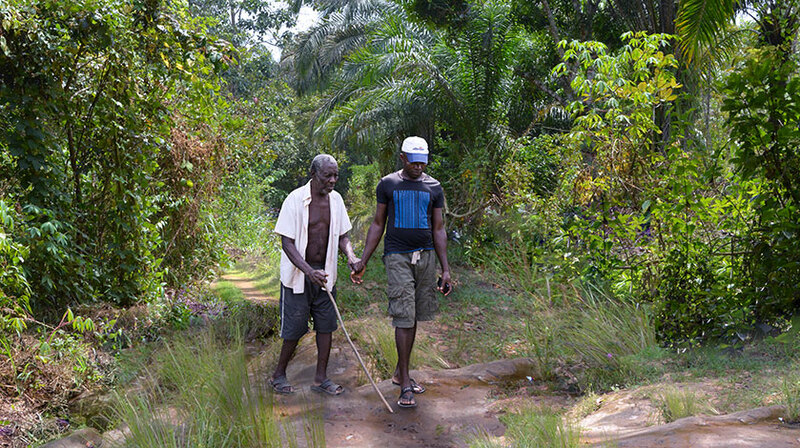 A much younger man also named Okechukwu lives just up the hill from Obodo's mud-block house; they lovingly call each other Ogbo, which means "namesake." Anytime the elder needs firewood or help with anything, all he has to do is shout, and his namesake comes running, eager to assist the man he also calls by the honorific title "uncle." "If Ogbo is around, I have no problems," Obodo says with a wide grin. "When he's not there, others help me. But it's not the same." Neighbors fetch water for Obodo, sparing him the risk of crossing the busy road or slipping on the slick rocks that line the river bank. During one of their frequent visits, two Carter Center Nigeria staff members, Adamu Sallau and Lazarus Nweke, inspect a fly trap set up beside the waterfall to collect specimens to track river blindness. Literally taking their work a step further, the researchers leap from rock to rock until they are in the middle of the stream just above the falls – quiet waters where crocodiles are sometimes seen silently swimming in the shadows. The men carefully turn over leaves of aquatic plants, looking for fly larvae. They don't have to look for long; the larvae are everywhere, disease vectors-in-waiting. Flies can't spread river blindness without infected people to bite, so the World Health Organization, the Enugu State Ministry of Health, and The Carter Center work together to make sure every eligible person in the area is treated with Mectizan®, an effective drug donated by Merck. The Carter Center would like to eliminate river blindness in Nigeria within five years. "It's an ambitious goal," says Dr. Frank Richards, director of the Center's River Blindness Elimination Program. "Nigeria is a big country that poses many challenges. However, the disease already has been wiped out in Ecuador, Colombia, Mexico, and Guatemala, so we know it can be done. Success in Nigeria's difficult environment would set the stage for similar achievements in other African countries." Okechukwu Obodo won't get his sight back, but his younger namesake and future generations would never have to worry about river blindness again.